Possibly one of the topics I get the most questions about: what does contemporary police and prison abolition look like, and is it truly feasible or just an ideal? Well, let's read. New to #BecauseWe'veRead? This is how we work! What a deeply important topic to close out the year with. 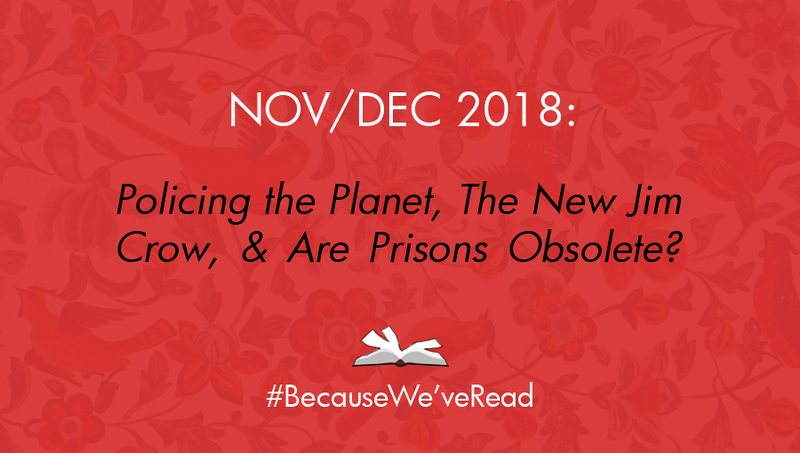 This #BecauseWeveRead unit on police, prisons, and abolition builds on our past units on race, anti-Blackness, and capitalism and explores the relationship of these themes as they are connected to global policing and mass incarceration that is deeply interwoven into the political and economic system of the United States. The prison-police industry is so vast and interconnected with, and dependent upon, anti-Blackness, anti-Muslim racism, classism, white supremacy, capitalism, and the maintenance of global empire and control. Police are truly a shared violence globally, from Israel to India to London to the United States, police around the world share tips, weapons, violence, and a mutual root in upholding an oppressive status quo. While most of these texts focus on the United States, many policing tactics are shared widely--and therefore so is the opportunity for global resistance and solidarity. We're reading the intro to the incredibly fundamental The New Jim Crow, a collection of essays and interviews on global policing, and of course a few chapters from Angela Davis' profound Are Prisons Obsolete? that focus on gender and imagining alternatives. In this unit, we're not just talking about systems and problems, but also encouraging a discussion about solutions. We're understanding and exploring the root of police and prisons to ask, and propose answers for, the questions: What are the relationships between the prison system, capitalism, race, and class? Can reforms fix this? What does justice look like? What does a world look like without police or prisons? Be sure to take a look through the additional resources, as there is quite a list of amazing podcasts, videos, visualizations, and articles that really take the readings to the next level and provide incredible depth to the topics and questions at hand! As mentioned on Instagram, due to popular demand, we are also moving to releasing a new book every two months (as opposed to every month) to give more time to everyone to read in time for the instagram live discussion and stay on-track (and for our international members to have their books delivered to them before the end of the month, hah)! The PDF is graciously provided by the incredibly wonderful and wonderfully radical Verso Books, the largest independent, radical publishing house in the English-speaking world! Verso Books is also providing #BecauseWeveRead members 50% off Policing the Planet! Grab this amazing discount here! + Ear Hustle (podcast), brings you the stories of life inside prison, shared and produced by those living it. + Invisible Institute, a journalism and research-based company on the South Side of Chicago conducting research, developing databases, and managing projects related to policing in Chicago. Check out their databases, projects, and reports! Check back soon as we finalize details for our youtube live discussion at the end of December!